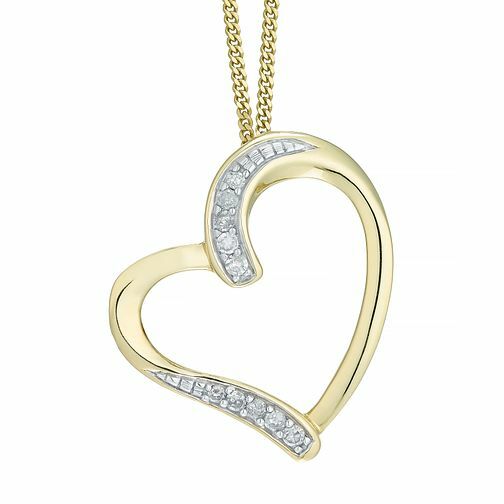 Set on a feminine fine chain, this shining 9ct yellow gold open heart pendant is set with delicately dazzling diamonds for a light-loving look. 9ct Yellow Gold Diamond Heart Pendant is rated 3.8 out of 5 by 6. Rated 3 out of 5 by Anonymous from Disappointing The chain and heart shaped pendant looked really great online. There was nothing to give it scale, so I purchased it in hood faith. I paid extra for gift wrapping. When it arrived, the gift wrapping was dreadful! I had to wrap it myself. I only managed to salvage the oversize ribbon. When I opened it to have a peek, I was seriously disappointed with the size. Tiny! I was so glad I had bought another gift for my girlfriend. One she loved. If I was relying on this item, I would've been on the Naughty list for the next 12 months. Thanks all the same. Rated 4 out of 5 by Anonymous from A really nice heart pendent This pendent is a beautiful piece of jewellery. That said, I recommend you check it in-store first, because side on it has some unusual (though not unpleasant) features.